Catering service for your next event! Call (619)-595-0115 or email at lotusthaisd@yahoo.com. I ordered the Lotus Thai fried rice to-go and I LOVED IT. It was a bit pricy but I would definitely order from them again... The staff is so friendly and helpful when helping you decide what to order. 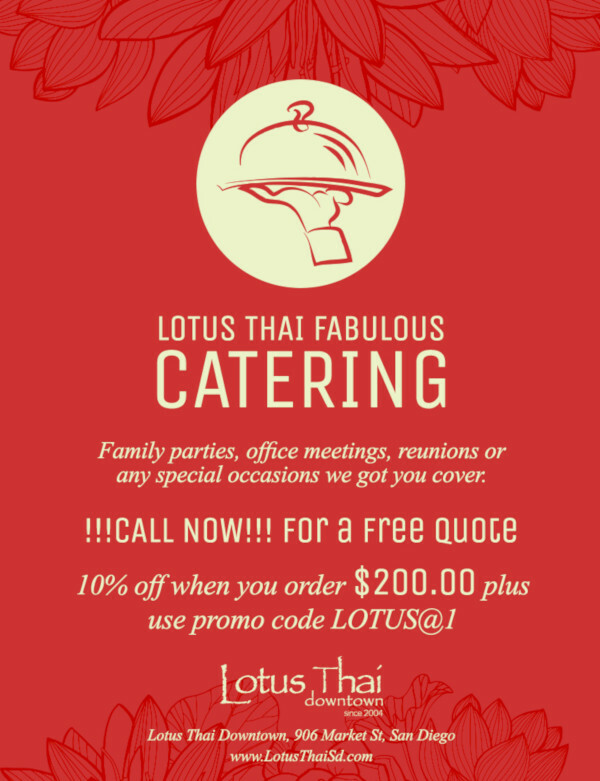 Expect to have the best, most fresh Thai cuisine at Lotus Thai at both the downtown location and Hillcrest location. I&apos;ve dined here for years... I&apos;m certain that after dining here it&apos;ll become your favorite go-to Thai restaurant. ...It&apos;s the best Thai food I&apos;ve ever had. They use quality ingredients and flavors are perfect! The service was excellent as well. My favorites were the green and red duck curries. I will definitely be back! This is the best Thai food I have had in my life. When I used to live in San Diego I would eat here three times. Week. It is amazing and such amazing prices. Try the green or red curry duck, you won&apos;t regret it!!!!! This is my favorite Thai food restaurant! GREAT Thai food! It can be super spicy though so I would try to keep it on the lower part of the scale if spicy food isn&apos;t your thing!! But it is delicious and pretty quick!